Complete sets are great for the game of golf: they provide beginners with a way to have everything they need to play! No need to buy everything separately. One, simple purchase and you are good to start learning. You probably think that all complete sets are the same. Let me assure you: they are not. Most brands (if you can even call them that) that are complete garbage – you should never buy from them, no matter how low the price is. Their materials are cheap. Their clubs perform terribly. The club heads will break off of the club shafts after just a few shots. Trust me: I’ve read hundreds of reviews from those companies. They are not pretty. Brand: brands are everything when it comes to buying a complete set. Never stray away from Strata (the most popular brand, which is a subsidiary of Callaway), Wilson, and Callaway. These brands are reliable, well-priced and high quality. Plus, all three of them have great customer service. If anything were to happen, they will gladly make it right. Your Goals: if you plan on taking golf pretty seriously, I’d recommend getting a complete set that has every types of club, such as a sand wedge and a hybrid. Many sets don’t include these clubs, but they will be worth learning how to hit if you have high goals for golf. If you just want a set to have some fun with some friends, you’ll be fine going with a set that isn’t necessarily “complete” with all clubs you need. Price: many beginner golfers are put off by the price of golf, and for good reason. That’s basically why I started this website: to help golfers save money on equipment. If you are like me, you’ll search for the best complete set of clubs that you can buy. I’ll help you out below. Size/Gender: the last thing you will need to make sure of is that you can are getting the right clubs for your height, age, and gender. Clubs for a tall, senior man are very different than clubs for a small, female child. That was probably pretty obvious though. Let’s start talking about the best complete sets that you can buy in 2019, shall we? I’ll break up this article into the best categories that I can think of. I’ll start off with complete sets for men (as that’s what most of this audience is), and then I’ll talk about women and kids! I’ll also throw in some “budget” options to help you save some money, too. Please know that I will earn a small commission for any item that you buy on eBay by clicking my links/pictures in this article. Thanks! Strata offers many different models of complete sets. Some contain everything you could ever need, like this Strata Ultimate Mens set does. All other sets are slightly lower priced and offer less clubs. So, you’ll need to determine exactly which clubs you are looking for. A lot of it will also come down to style preferences (which color/design you prefer). If you want every club that you would ever need (driver, fairway wood, hybrid, irons, wedges, and a putter), this is definitely the set for you. The clubs are super easy to hit. You don’t have to hit the center of the club face to result in a good shot. Even mishits will end up OK. The clubs are made with very high quality materials. You’ll never have to replace this set until your skill level has simply outgrown the ability of these clubs. Why it’s #1: The Ultimate set is #1 because it’s made by the best brand and it contains everything you would ever need. 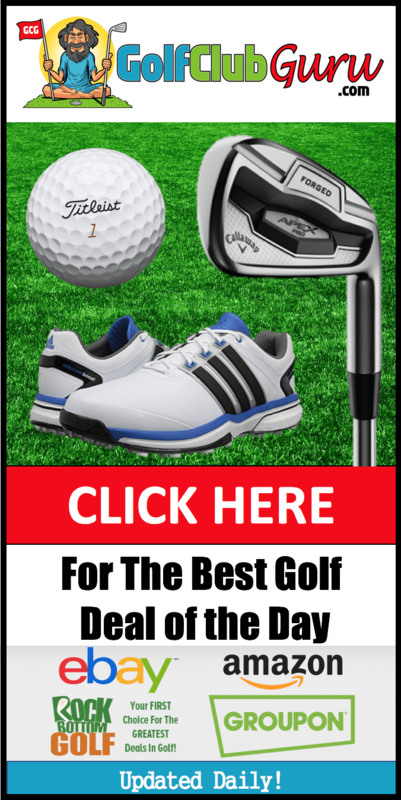 Who it’s best for: It’s best for someone that wants to truly learn to hit all types of shots correctly (bunker shots with a sand wedge, long shots with a hybrid, etc). Many beginners end up buying the best possible set with all of the bells and whistles. Other people realize that, as long as they have most of the clubs that they need, they’ll be fine. Personally, I am a part of that group. You don’t really need a bag full of clubs to learn the game. For that reason, if I were to go back in time when I first started playing golf, I would purchase the Strata Complete Mens set. It’s a complete set, as the name implies, but it doesn’t have as many clubs as the Ultimate version. It has one less fairway wood, one less hybrid, and no sand wedge. One fairway wood and one hybrid is plenty for a beginner, and not having a sand wedge is actually not a big deal at all. You can hit bunker (sand) shots with any iron believe it or not. Using a pitching wedge is nearly just as good as using a sand wedge out of a bunker. It’s not as easy, but you can learn. Plus, you can also just buy a sand wedge separately. You’ll more than likely end up with a higher quality sand wedge to begin with, even though it will cost a tad bit more to go that route. Why it’s the best value set: It’s priced far below the Strata Ultimate Set, and still has everything that most people would want/need to start learning the great game of golf! 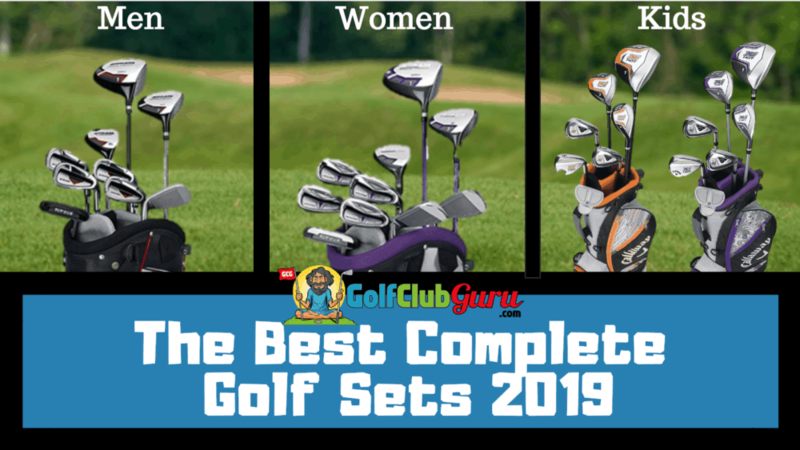 Who it’s best for: It’s best for someone that wants the best value golf set, even though they won’t have a sand wedge. It’s also perfect for someone that already has a sand wedge (from a friend or parent, for example). The Strata complete sets are truly hard to beat in 2019. However, if you want to save an extra $30-40, the Wilson Ultra Mens set should definitely be considered. Wilson actually used to be the TOP brand in all of golf, but it has slowly fallen over the years. Wilson produces pretty high quality clubs at crazy low prices, though. The quality is nearly just as good as Strata’s. When it comes to performance, I would say that Wilson sets fall behind when compared to Strata sets. It’s not a significant difference, though. Like the Strata Complete Set, the Wilson Ultra set doesn’t have a sand wedge either. Like I mentioned earlier, though, it’s not really a big loss. Why it’s still worth buying: Comes from a high quality brand and will save you a decent amount. 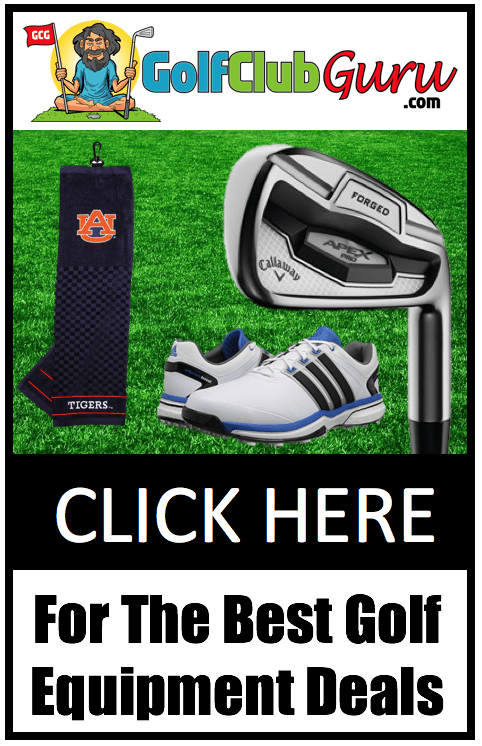 Who it’s best for: Those that are on a super tight budget but still want a high quality set of clubs that won’t break in the first year or two. You’ll be sacrificing a bit of performance in exchange for saving an extra $20 bill or two. My advice for women is actually identical to my advice for men. It’s all about finding exactly what you need/want. It’s a give and take. You’ll have to give some extra money to get the extra clubs. If they are not worth the extra price, just stick with the basic set instead, like the Strata Complete Women’s set. That’s personally what I would do. You do you, though! The Ultimate set is truly the best full set that women can buy in 2019. The only other option to get clubs of this quality would be to buy all clubs individually (driver, woods, hybrids, irons, wedges, putter, bag, etc). That’s a lot of work though. It’s much better for beginners to simply buy complete sets. With the Strata Ultimate set, you’ll receive every club that you could ever want, including a hybrid, a fairway wood, and a sand wedge. For beginners, these clubs will perform just as good as premium brands like Titleist, Callaway, TaylorMade, etc. The Strata Ultimate clubs are the best combination of distance, overall performance, and quality. The driver will fly far. The woods and hybrids are easy to hit. The irons will get in the air quickly and easily. The wedges will stop the ball quickly, and the putter is super simple to align to the hole. Let’s just say Strata knows what they are doing when they design their club specifically for beginners. Why it’s the overall best set: It’s the best full set brand in golf, and it includes all clubs that you’d ever want. Who it’s best for: Women that plan on playing golf for many years to come. It’s best for women that want to correctly learn how to hit a bunker shot with a sand wedge. If you decide that you’d rather save some money and go without a few clubs, you’d be better off going with the Strata Complete set. In exchange for giving up on a hybrid, fairway wood, and sand wedge, you’ll save a pretty significant amount of money. You’ll have to decide which set is best for you. Truthfully, you can’t go wrong with either one. They will both be great for women learning the game. Personally, I would go with the Strata Complete set. It’s less expensive and is still plenty for beginners. You can tell that I am being honest, because I am getting a (albeit small) commission on what you buy from my links. I’d hate to recommend products that you don’t truly need, though. Plus, also worth noting is the fact that you can take your savings and get a golf lesson. That’s a much more beneficial use of your money as a beginner. Why it’s the best value set: The #1 brand in complete set. The savings in cost are well worth giving up a few clubs that you’d probably hardly use anyway (get a lesson instead!). Who it’s best for: Women that would rather save a few bucks than spend money on clubs that they would hardly hit. I taught golf to kids at a local country club for all four years of my undergrad. Let’s just say that this Callaway XJ Hot golf set was by far the most popular among boys. Every kid that had one loved their set more than you would ever assume a boy would. They loved showing these clubs off to their friends. Eventually, their friends miraculously ended up getting the same set after a while. I think it’s kinda funny to be honest. The kids loved it because the bag and clubs looked cool. Jokes on them, though: the clubs are actually super high quality and well-made. The clubs are just like Callaway’s premium club offerings… except in a smaller version. Why it’s the overall best set: Kids love them. It makes kids more excited for golf. At the same time, the sets are super high quality and perform really well. Same as for the boys, girls love the Callaway XJ Hot set. It’s a perfectly designed set. Girls love the designs and love showing all of their friends. When girls get excited for golf, you know you did something right. When I worked at the country club teaching kids, I saw MANY girls with this set. There is another brand called U.S. Kids. They make very high quality clubs as well, but they are much harder to find and typically don’t come with many clubs at all. I’d highly recommend the Callaway XJ Hot set instead. Why it’s the overall best set: Girls love to show their friends. Comes in two different sizes. Great performance all around. Have you ever considered publishing an e-book or guest authoring on other blogs? I have a blog centered on the same information you discuss and would love to have you share some stories/information. I know my subscribers would appreciate your work. If you’re even remotely interested, feel free to send me an e mail.